There are two kinds of headwinds: the cooling one and the nuisance one. And there is a very fine line between the two. Here in the South, we are definitely experiencing the humidity – and the gentle cooling breeze makes it tolerable. When the wind speed picks up, it becomes a nuisance. Today we were traveling southeast, the wind was from the southeast, and it continued to waver between cooling and nuisance. 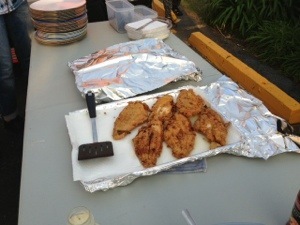 Because the riders were staying at two different inns in the St. Francisville area, the snack table was set up 18 miles into the route. 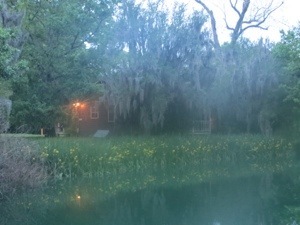 Don brought me back to the Butler-Greenwood plantation just as the sun was coming up to reconnect me to my bike and my riding friends. The early morning scenes at the plantation were lovely. 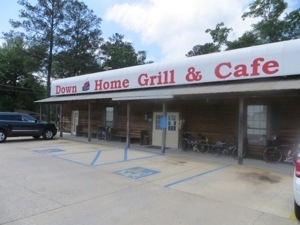 For the first time, there was a blatant error on the cue sheet, and several riders following the instructions rode back toward St. Francisville rather than to Jackson for our sag stop. Luckily, Donna and I were far enough back in the pack to get the corrected instructions and make the correct turn. There was a train museum in Jackson, but we did not stop. I did photograph this caboose (and wondered to myself where all the cabooses of yesteryear are now located. 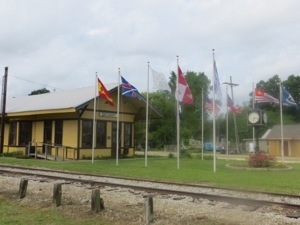 The old train station had the many flags of Louisiana. 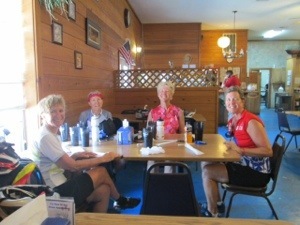 At mile 56, we stopped for lunch at the Down Home Grill and Cafe. It really is nice to get off the bike and into air conditioning for a while. 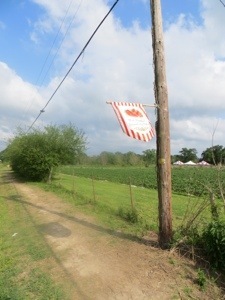 This part of Louisiana does not seem to have any special crops. We saw some horses, a few cows, a few lumber trucks, and lots of trailer homes and manufactured houses. Even passed by a large prison complex. And no historical markers! 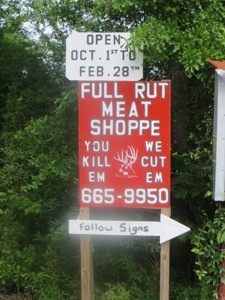 I did like this sign, which suggested hunting. In the final 10 miles, we were on a search for ice cream. 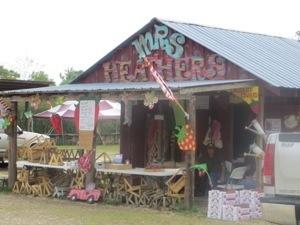 We didn’t find any at this lovely strawberry patch, but were treated to ice cream bars by a former rodeo rider further down the road. He thought he would like to ride his horse cross country?! Cook Linda decided we should have a real Louisiana meal tonight and fried up catfish, also red beans and rice with cole slaw on the side. And some of those delicious strawberries for dessert. 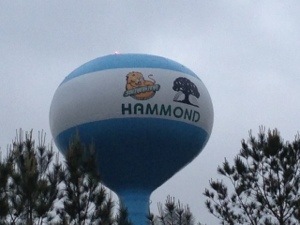 We are staying in Hammond tonight, which is north of New Orleans, across the Lake Pontchartrain causeway. Rode 92 miles today, according to the cue sheet (I am having bike computer issues, so no average info). I have been thinking about your quest. Unfortunately it is when I am on my bike instead of in front of my computer. I am most pleased to see your progress and the great collection of photos. I noted that your trip mates always appear to be smiling. I am so impressed with your upbeat attitude and steadfast perseverance. Smiling keeps the bugs out of our teeth. I am really enjoying this adventure. 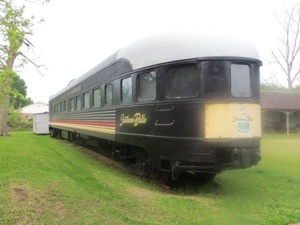 That looks like a full size railcar! I had the very same thought about what ever happened to all the cabooses of days gone by as I waitied for several trains on my drive from northern Indiana over to my mother’s in Illinois this past week. I do know that former Senator Frank Murkowski (Alaska) made one into a getaway home in either Alaska or Washington State. Chris worked for him for awhile when he was in DC.